Acer America has started offering its FT200HQL 20-inch class monitors this week. The touchscreen, at $199 (around £121, or AU$223), is an affordably priced Windows 8 compliant monitor designed with an eye toward providing a comfortable experience for the user. The 19.5 inch screen features an LED-backlit display with 10-point capacitive touch that recognises common gestures, like the pinch-to-zoom and swipes, and boasts a 5ms response time. The monitor's 1600x900-pixel resolution sounds relatively low, but a 100,000,000:1 contrast ratio means it won't be lacking for sharp contrast and depth. For a relatively low price, the FT200HQL packs plenty of positions for comfortable use of the touch screen while gaming, checking email or other activities. It has wide viewing angles of up to 170 degrees horizontally and 160 degrees vertically, while the stand can be tilted from 10 to 90 degrees. The monitor is also wall-mountable. It also houses dual speakers, though ports are sparse, with only one VGA and HMDI. "The Acer FT200HQL is a great choice for consumers or small businesses wanting an affordable and compact touch display for making the most of Windows 8 touch capability," said Frank Chang, director of product management for Acer America. "Our newest touch display provides excellent image quality, intuitive touch and comfortable ergonomics. Its compact frame is a great size for multi-monitor set-ups, while the wide viewing angles enhance collaboration with others." Inexpensive Windows 8-ready monitors are a slowly increasing presence, the Dell 20 Touch was the one of the lowest priced models with similar specs before the FT200HQL's release. 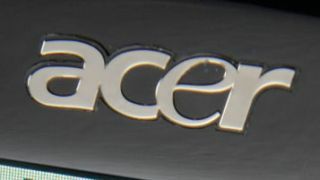 Due to it's low price, however, the Acer monitor does have drawbacks in a lack of connectivity, low resolution and lightweight build. The Acer FT200HQL is available in the U.S. with prices starting at $199 (around £121, or AU$223). No word on EU or pricing availability yet. Should Windows 8 have been for touchscreens only?